Lindsey Buckingham Biography, Wife, Net Worth, Why Was He Fired? Home Musicians Lindsey Buckingham Biography, Wife, Net Worth, Why Was He Fired? Lindsey Buckingham is a legendary guitarist who is best known for having been a member of British-American Rock Band, Fleetwood Mac. The now-fired former lead guitarist and vocalist of the group, who was revered for his ability to not play the guitar with a pick; instead, picking the strings with his fingers and fingernails, has also had a successful solo career via his six solo albums and three live albums. On the 3rd of October, 1949, in Palo Alto, California, Rutheda (née Elliott) and Morris Buckingham welcomed their youngest of three children; Lindsey Adams Buckingham. As a child, Buckingham and his older brothers; Jeffrey and Gregory, were encouraged to participate in sports, specifically swimming. The young lad attended Menlo Atherton High School in the San Francisco Bay Area of Atherton where he swam until he quit to concentrate on his musical interests. 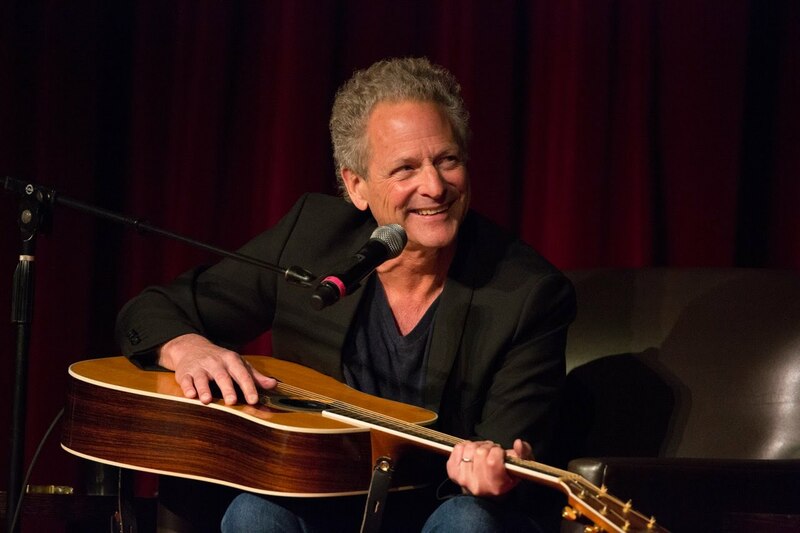 After noticing their son’s interest in music, Lindsey Buckingham’s parents bought him a guitar but however, they never enrolled him to take music or guitar lessons. Buckingham taught himself how to play and by the time he was finishing high school, he joined a local band named The Fritz Rabyne Memorial Band in 1966. During this time, he also enrolled at San Jose State University but did not graduate. As a member of Fritz, Buckingham invited his friend Stevie Nicks to join the group as a second vocalist. The pair stayed with the group for five years before leaving to form a duo. With the hope of becoming the next big thing in music, Lindsey Buckingham and Stevie Nicks, who he had begun to date, moved to Los Angeles together to get a record deal. Things looked to be going according to plan as they were almost immediately signed by Polydor Records in 1973. However, following the poor sales of their debut album titled Buckingham Nicks, the record label released them. Buckingham and Nicks began searching for a new deal and as things would pan out, drummer and co-founder of Fleetwood Mac, Mike Fleetwood, heard Buckingham’s guitar skills on one of his songs and was interested in working with him. Buckingham, however, refused to join the group unless his girlfriend/collaborator was also brought along. Mike Fleetwood was said to have hired both of them on the spot without an audition, a move that led to the creation of songs like “Go Your Own Way,” “Tusk” and “Second Hand News,” as the rest became history. Lindsey Buckingham first left Fleetwood Mac in 1987 following his breakup with his girlfriend. He said he could not stand having to always see and work with her while still seeking closure from their breakup, hence, his decision to leave. In his time away, Buckingham embarked on a solo career before returning to the group in the mid-1990s, joining them on their The Dance reunion tour in 1996. Buckingham’s return seemed to have given Fleetwood Mac a resurgence as the group actively toured for long periods of time. In April 2018, however, things looked to have gone south as Buckingham was this time, fired from the group just before they were about to head out on tour again. It was reported that his firing came after a disagreement over the band’s upcoming tour. The band has since replaced their star guitarist as he himself has accused the group of losing their perspective. Lindsey Buckingham is said to have a net worth of $80 million. The singer and guitarist, who was inducted into the Rock and Roll Hall of Fame in 1998 as a member of Fleetwood Mac, was able to make bank, thanks to the huge success he has enjoyed in music, both as a solo artist and as a part of a group. In the 70s and 80s, Fleetwood Mac was one of the biggest bands in the world. They were known to sell out arenas and stadiums whenever they were on tour and have sold more than 100 million records worldwide, making them one of the world’s best-selling bands. Kristen Messner is the stunning wife of Lindsey Buckingham. The couple, who have been together for over twenty years, got married in 2000 after having met at a photo shoot for one of his solo albums. Messner, who now goes by Kristen “KB” Buckingham, was once a well-known photographer but now mainly works as an interior designer. Together, the couple has three children; son William Gregory Buckingham – born on the 8th of July, 1998, daughter Leelee Buckingham – born on the 15th of July, 2000, and Stella, another daughter, who was born on the 20th of April, 2004.